In the movie ‘Starsky and Hutch’, Snoop Dogg makes an amazing statement before the climax – “Why get to the start line when you can directly get to the finish?” This statement holds good from a business perspective as well. One way is to Create a Coin and bet on probabilities of whether it would get listed on an exchange or not. The other is to have your token listen on an exchange as a fundraising medium for companies, and let the exchange convert it into a listed coin after the crowdsale! The latter is precisely what Initial Exchange Offering (IEO) is about. An IEO, as the name suggests, is the process of an exchange offering tokens to its customers. The difference, however, is that a startup looking for funds has initiated the process of this token being created and listed. It is administered by a cryptocurrency exchange on behalf of that startup which looks forward to raising funds with the newly issued token. The contributors can simply fund their exchange wallets and use that to buy the tokens of the company that is looking forward to investments. The token sale is conducted on the exchange platform itself and this listing comes with a small fee along with the percentage of the tokens sold during the IEO. The tokens are sold on the exchange platforms and the coins are listed after the IEO is over. The IEOs have a visible advantage for both the companies that are looking forward to raising funds and the exchanges. Since, the token is listed on an established exchange, there is no hassle to create the trust or initiate liquidity by showing transactions. The exchange is already well-established and it has all the credentials required to put the token into circulation. The companies do not have to factor their resources in creating a smart contract – something that is mandatory in case of an ICO. Instead, the companies will simply need to create accounts on the exchange platform where the IEO is conducted. The cryptocurrency exchange takes a part of the tokens sold by the startup, and this serves as an incentive for the exchange to list the tokens. In addition to this, the exchange can also passively leverage the marketing efforts by the company in their endeavor to promote their tokens. There has been an increasing trend when it comes to cryptocurrency exchanges embracing IEOs. Binance, one of the first names that come to mind when talking about crypto exchanges, has launched its own IEO platform called the Binance Launchpad. In January this year, BitTorrent raised a whopping $7.2 million – the crowdsale hard cap – in less than 15 minutes by initiating a token sale on the Binance Launchpad. Surpassing this already astounding record, the second IEO on Binance Launchpad, Fetch.ai hit the hard cap of $6 million in just 22 seconds. Since Binance established its success in handling IEOs, a lot of notable exchanges jumped the bandwagon and introduced their own IEO platforms. Some of the most notable ones in addition to the one by Binance are Bitmax Launchpad, Bittrex IEO, OK Jumpstart, and Huobi Prime. 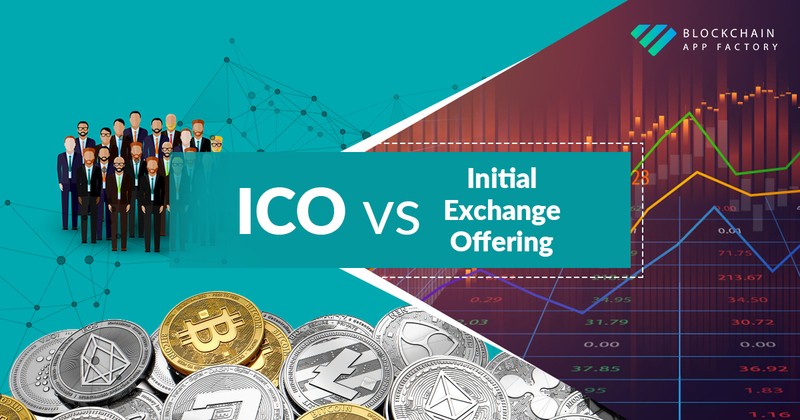 An ICO is issued by the company’s website, whereas the IEO is handled by the exchange itself. The sale of the tokens is conducted by a trusted exchange in an IEO as opposed to the company when it comes to ICO. Since the exchange conducts KYC/AML on its users, the onus of verifying and validating the investors does not fall on the company in an IEO. In an endeavor to protect its name, the exchange will validate the company, and it significantly reduces the probability of frauds and scams when issuing an IEO. One of the greatest advantages that IEO brings to the table is trust. The cryptocurrency exchange platform meticulously analyses every project before it lists their tokens on the exchange. This process brings down the instances of scams and dubious projects from raising funds through exchange platforms. On one side, it is the interest of the investors that are protected by IEO ensuring that no malicious companies are listed. On the other hand, since the exchange handles the KYC/AML process, the companies can be assured that their tokens are being bought only by genuine investors. The startups that issue tokens stand to benefit from easier, streamlined and a flawless process of launching IEO on exchange platforms. This is comparatively easier than the classic ICO model where they have to do everything on their own. Yes, it might cost the fundraising organizations the feet that they have to pay to the exchange. However, since the exchange can market it for them, the marketing budget is relatively lower. In addition to this, since an exchange already has an existing customer base, they do not have to start from scratch on day one. In ICO, the company had to undergo the tedious task of listing their tokens on exchanges. When it comes to IEO, the exchange in itself takes care of listing the coin after the crowdsale is over. There were instances where the listing fee was as high as 20 bitcoins and the exchanges have demanded a 10% cut of the tokens. In all of these, the relative ease of the entire process wins brownie points for IEOs. IEOs are relatively rare in the crypto community and it might not be easy to find one that suits your requirements. When you have found one, the process is pretty straight forward. The first thing to do is to find the exchange that hosts the crowdsale. Having done that, you will need to create an account on the exchange and complete the KYC/AML process, after which you are free to contribute to the IEO. All you need to do is fund your wallet with an accepted coin and by the tokens. To reap the benefits of your investment,you will have to wait until the exchange starts to buy your token. Will The IEO Change the Game? ICOs created the fundraising boom in 2017 and 2018. However, the dubious record it holds is that most of them were operated by scammers. This alone cannot be used as a point to say that ICOs are a bad fundraising model. IEOs, however, provide an increased magnitude of trust both because of the exchanges and the validation of the projects by the exchanges. This improves the efficiency of the crowd sale in addition to other factors like security and trust. While IEOs might have all the required credentials to become the standard model for fundraising in the cryptocurrency space, it would take some time for the IEOs to become mainstream. Take advantage of this trend while it’s hot. Launch Your Own IEO in Two Weeks!